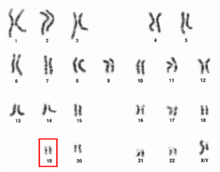 Human chromosome 19 pair after G-banding. Chromosome 19 is one of the 23 pairs of chromosomes in humans. People normally have two copies of this chromosome. Chromosome 19 spans more than 58.6 million base pairs, the building material of DNA. The following are some of the gene count estimates of human chromosome 19. Because researchers use different approaches to genome annotation their predictions of the number of genes on each chromosome varies (for technical details, see gene prediction). Among various projects, the collaborative consensus coding sequence project (CCDS) takes an extremely conservative strategy. So CCDS's gene number prediction represents a lower bound on the total number of human protein-coding genes. See also: Category:Genes on human chromosome 19. The following is a partial list of genes on human chromosome 19. For complete list, see the link in the infobox on the right. NWD1: NACHT and WD repeat domain containing 1. FUT1: The H locus is located on chromosome 19 at 19q13.3. It contains three exons that span more than 5 kb of genomic DNA, and it encodes a fucosyltransferase that produces the H antigen on RBCs. FUT2: The Se locus is located on chromosome 19 at 19q13.3. It contains two exons that span about 25 kb of genomic DNA. The Se locus encodes a specific fucosyltransferase that is expressed in the epithelia of secretory tissues, such as salivary glands, the gastrointestinal tract, and the respiratory tract. The enzyme it encodes catalyzes the production of H antigen. G-banding ideogram of human chromosome 19 in resolution 850 bphs. Band length in this diagram is proportional to base-pair length. This type of ideogram is generally used in genome browsers (e.g. Ensembl, UCSC Genome Browser). G-banding patterns of human chromosome 19 in three different resolutions (400, 550 and 850). Band length in this diagram is based on the ideograms from ISCN (2013). This type of ideogram represents actual relative band length observed under a microscope at the different moments during the mitotic process. ^ a b "Search results - 19[CHR] AND "Homo sapiens"[Organism] AND ("has ccds"[Properties] AND alive[prop]) - Gene". NCBI. CCDS Release 20 for Homo sapiens. 2016-09-08. Retrieved 2017-05-28. ^ "Statistics & Downloads for chromosome 19". HUGO Gene Nomenclature Committee. 2017-05-12. Retrieved 2017-05-19. ^ "Chromosome 19: Chromosome summary - Homo sapiens". Ensembl Release 88. 2017-03-29. Retrieved 2017-05-19. ^ "Human chromosome 19: entries, gene names and cross-references to MIM". UniProt. 2018-02-28. Retrieved 2018-03-16. ^ "Search results - 19[CHR] AND "Homo sapiens"[Organism] AND ("genetype protein coding"[Properties] AND alive[prop]) - Gene". NCBI. 2017-05-19. Retrieved 2017-05-20. ^ "Search results - 19[CHR] AND "Homo sapiens"[Organism] AND ( ("genetype miscrna"[Properties] OR "genetype ncrna"[Properties] OR "genetype rrna"[Properties] OR "genetype trna"[Properties] OR "genetype scrna"[Properties] OR "genetype snrna"[Properties] OR "genetype snorna"[Properties]) NOT "genetype protein coding"[Properties] AND alive[prop]) - Gene". NCBI. 2017-05-19. Retrieved 2017-05-20. ^ "Search results - 19[CHR] AND "Homo sapiens"[Organism] AND ("genetype pseudo"[Properties] AND alive[prop]) - Gene". NCBI. 2017-05-19. Retrieved 2017-05-20. ^ Bearer EL, Chen AF, Chen AH, Li Z, Mark HF, Smith RJ, Jackson CL (2000). "2E4/Kaptin (KPTN)—a candidate gene for the hearing loss locus, DFNA4". Ann Hum Genet. 64 (3): 189–196. doi:10.1046/j.1469-1809.2000.6430189.x. PMC 3376086. PMID 11409409. ^ a b Dean, L. (2005). "Ch. 5: The ABO blood group". Blood Groups and Red Cell Antigens. Bethesda MD: National Center for Biotechnology Information. NBK2261. ^ Gilbert F (1997). "Disease genes and chromosomes: disease maps of the human genome. Chromosome 19". Genet Test. 1 (2): 145–9. doi:10.1089/gte.1997.1.145. PMID 10464639. ^ "OMIM Entry - # 613845 - HYPERURICEMIA, PULMONARY HYPERTENSION, RENAL FAILURE, AND ALKALOSIS SYNDROME; HUPRAS". www.omim.org. Retrieved 20 January 2017. ^ Moss, K (Spring 2001). "Leber's Congenital Amaurosis". Texas Deafblind Outreach. Texas School for the Blind and Visually Impaired. Archived from the original on November 19, 2013. ^ Sethakulvichai, W.; Manitpornsut, S.; Wiboonrat, M.; Lilakiatsakun, W.; Assawamakin, A.; Tongsima, S. (2012). "Estimation of band level resolutions of human chromosome images" (PDF). In Computer Science and Software Engineering (JCSSE), 2012 International Joint Conference on: 276–282. doi:10.1109/JCSSE.2012.6261965. Grimwood J, Gordon LA, Olsen A, Terry A, Schmutz J, Lamerdin J, Hellsten U, Goodstein D, Couronne O, Tran-Gyamfi M, Aerts A, Altherr M, Ashworth L, Bajorek E, Black S, Branscomb E, Caenepeel S, Carrano A, Caoile C, Chan YM, Christensen M, Cleland CA, Copeland A, Dalin E, Dehal P, Denys M, Detter JC, Escobar J, Flowers D, Fotopulos D, Garcia C, Georgescu AM, Glavina T, Gomez M, Gonzales E, Groza M, Hammon N, Hawkins T, Haydu L, Ho I, Huang W, Israni S, Jett J, Kadner K, Kimball H, Kobayashi A, Larionov V, Leem SH, Lopez F, Lou Y, Lowry S, Malfatti S, Martinez D, McCready P, Medina C, Morgan J, Nelson K, Nolan M, Ovcharenko I, Pitluck S, Pollard M, Popkie AP, Predki P, Quan G, Ramirez L, Rash S, Retterer J, Rodriguez A, Rogers S, Salamov A, Salazar A, She X, Smith D, Slezak T, Solovyev V, Thayer N, Tice H, Tsai M, Ustaszewska A, Vo N, Wagner M, Wheeler J, Wu K, Xie G, Yang J, Dubchak I, Furey TS, DeJong P, Dickson M, Gordon D, Eichler EE, Pennacchio LA, Richardson P, Stubbs L, Rokhsar DS, Myers RM, Rubin EM, Lucas SM (2004). "The DNA sequence and biology of human chromosome 19". Nature. 428 (6982): 529–35. doi:10.1038/nature02399. PMID 15057824. Wikimedia Commons has media related to Human chromosome 19. National Institutes of Health. "Chromosome 19". Genetics Home Reference. Retrieved 2017-05-06. "Chromosome 19". Human Genome Project Information Archive 1990–2003. Retrieved 2017-05-06. This page was last edited on 14 December 2018, at 09:05 (UTC).